At the International Property Awards ceremony, held at the iconic Savoy Hotel in London on 4 December 2017, Waterfall Management Company was awarded the Best International Mixed-use Development Award for 2017/2018 for the Waterfall Estate development. The awards cover the regions of Asia Pacific, Africa and Arabia, Europe, the United States of America (USA) and the Americas, as well as the United Kingdom (UK), celebrating the very best projects and professionals in categories ranging across property development, real estate, interior design and architecture. Over the past year, a panel of over 80 expert judges, chaired by four UK lords, has assessed thousands of entries from 115 countries. Judging focuses on design, quality, service, innovation, originality and commitment to sustainability. Willie Vos, chief executive officer of Waterfall Management Company, said: “After winning the award for Best Mixed-use Development in South Africa and Africa, for four years running, we are thrilled that Waterfall has finally been recognised for the world-class city that it truly is. The significance of being awarded Best International Mixed-use Development for 2017/2018, is that property professionals worldwide will now take note of South Africa’s ability to build world-class developments. Waterfall Management Company is the property and asset management company of the shareholders of the Waterfall land. Since 2004, Waterfall Management Company and its shareholders have been working with a group of first-class developers to create the largest mixed-use development in Africa. This 2 200ha leasehold development, in the heart of Gauteng, offers integrated live-work-shop-play environments that provide unsurpassed quality of life in a vibrant urban environment. By completion in about 2027, the current estimated developed value is approximately R100 billion. While the Waterfall development currently creates jobs for over 15 000 people, once completed, it will have created close to 70 000 job opportunities. The development in its entirety is also already responsible for contributing to rates and taxes to the City of Johannesburg of close to R300 million per year. This figure is expected to reach over R1 billion per annum by the time of completion. One of the major role-players in the development is Attacq, who has the future development rights for all commercial, retail and industrial developments. Developments by Attacq and its partners include The Mall of Africa, the PWC building, Amrod, the BMW distribution centre, the Massbuild distribution centre and the Deloitte building, to name but a few. Century Property Developments is responsible for the development of middle- and high-end residential developments. Waterfall Equestrian Estate, two retirement villages and Waterfall Country Estate and Village are some of their successes. Calgro M3 has developed the highly successful Waterfall View development, consisting of 714 lower-income houses, while Balwin has recently completed the first 500 of the planned 20 000 high-density units, aimed at middle- and lower-income groups. Other former and current role-players are Sanlam, Growthpoint, Zenprop, Netcare, Atterbury, Curro Schools, Reddam Schools, BP and Sasol. For more information on Waterfall Estate, visit www.waterfall.co.za. Waterfall is the largest property development in South African history, combining approximately 23 000 residential units that will eventually house an estimated 100 000 people, with commercial and office space that will accommodate a further 75 000 people. 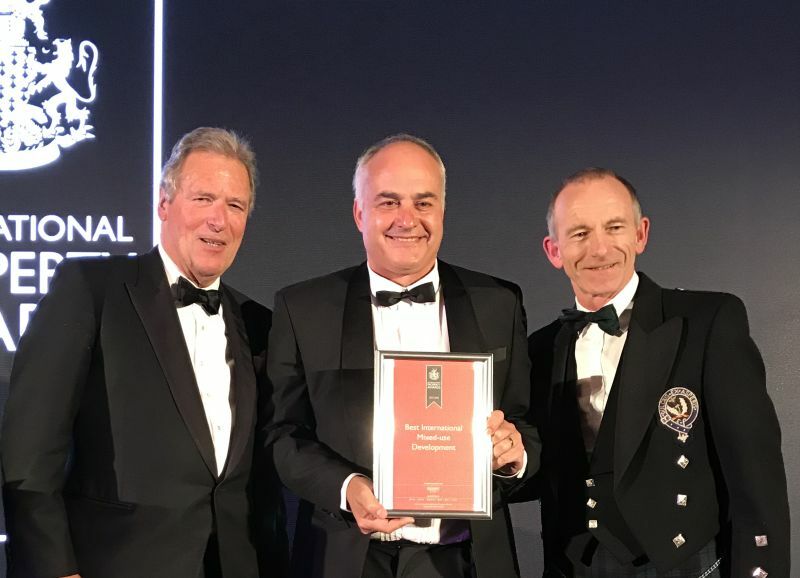 Caption main image: Willie Vos, chief executive officer of Waterfall Management Company, receives the award for Best International Mixed-use Development for 2017/2018 for Waterfall Estate, at the International Property Awards ceremony, held in London on 4 December 2017.